I tried Cella soap the other day and I was not impressed with it. But I hear so much about it I just had to give it another go today. This time I used more water & more product. It was really nice. I should have worked the lather a little more because it had some air bubbles in it but I will keep an eye on that the next time. It is a great soap. I'm glad you got it to work for you. It is quite nice! Whenever you seem to be having issues with lathering most any soap, just use more product, or rub the soap/puck on your face if you can! I only just recently tried Cella for the first time, was a gift from someone that was in Italy and I'm very glad I did. Its scent is quite pleasant, but mild (to me). But it sure creates some slick and extremely cushioning lather very easily. Using more product just means that you get to try many other products soon Glad your 2nd chance is working out for you! I've been using it for the past week and so far, this croap is what my skin likes best. Good enough glide and cushion but the post shave feel is the most natural I've felt. No heavy residue. No dry feeling. Just clean skin. ASB absorbs faster too. I'm impressed! Cella is great stuff! I find that almost all the Italian soft soaps lather wonderfully — some just smell better than others. It's not bad. It certainly lathers easily. I first tried Cella a few years ago and I suspect I got a chunk of a freshly made batch. I'm quite sensitive to scent and it doesn't take much scent for it to be too strong. It absolutely reeked of a far too strong synthetic scent. The performance was OK, not the best Italian croap by any means, but good. By far, it had the most disgustingly strong scent of any soap I've ever encountered. It's been a few years now and the soap has had time to age and age makes many soap scents better. Now my Cella is actually quite good. If I wasn't burnt out from testing soaps and such I'd retest it against the croaps it lost against those years ago. But I'm actually in Cella attrition mode now. I want it out of my cabinet and I'm trying to use what's in the cabinet so as to move it out for a time. When I finish testing my KFBR soap with all of my brushes I'll return to using the Cella frequently so as to use it up. Cella lathered well for me but I gag on the scent. It does not smell like almonds to me at all. Same with Vitos Red, lathered well but the scent was like Cella. This put me off almond scented soaps. Then someone gave me a chunk of Boellis Panama 1924 to try, now that is a very nice almond scent. I am really enjoying the 1924. Funny how people perceive scent differently. I do generally like Italian croaps though. I get nice lather from Cella, but seems to take me more time than others soaps/croaps. I've always had good luck with Cella. As far as the scent goes, not only is the scent a "different strokes" kind of thing, but scent itself is very much a YMMV thing. Some like it subtle, but it's part of what makes my morning when the soap fills the whole bathroom with it's scent while I'm lathering. 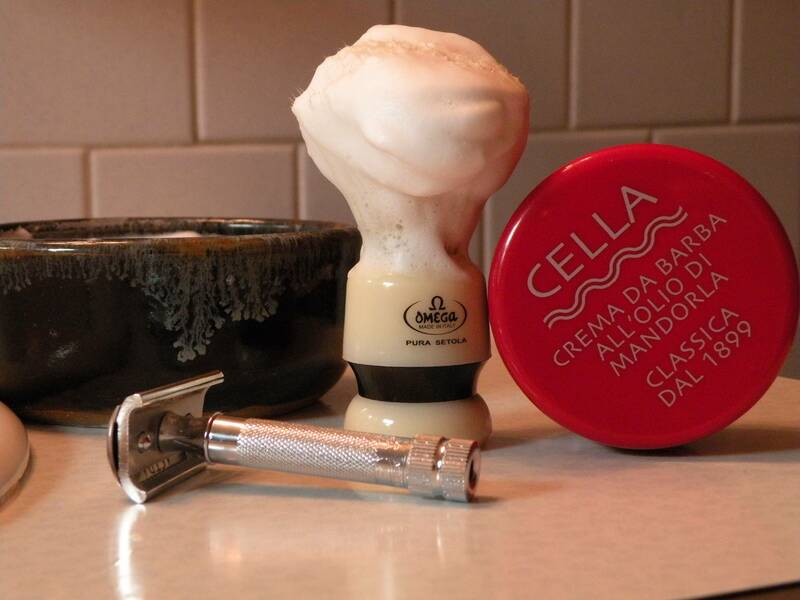 Cella is good but for that Italian almond-paste, marzipan scent my current favorite is Razorock Classic; to me it's a better almond scent, but if you find Cella's scent too strong, do NOT try the Classic! I use Marco's method with Cella (wet brush, load for 20-30 seconds) followed by a minute of various circular and painting strokes while face lathering and maybe an addition or two of water depending on the texture. It is one of the soaps that I found easiest to dial in, but it does take more water than it seems at first to get a good balance of slickness AND protection. Cella has been part of my rotation for quite sometime now. I love the slick lather it produces. (12-22-2014, 10:56 PM)ShadowsDad Wrote: It's not bad. It certainly lathers easily. Brian, if you don't like it just throw it out. I was keeping soaps I didn't really like in my cupboard in the unlikely event I would use them. Never happened. I gave them all to a friend of mine the other day and feel all the better for it. They're only like $10 a jar and not like fragrances or other hobbies that cost considerably more. I feel actually some similarity. I love Cella, and I'm sorry it didn't work for you at first. Glad you gave it another go. But I agree with mixershave; if you don't like a soap, PIF it to someone. I keep a "PIF box" in my head. It is filled with shaving product that I don't like, or didn't work well for me. When the occasion arises and I see someone that needs/wants something I have, I'll drop them a PM. I've got one guy in mind in the next couple of weeks. (12-23-2014, 04:32 AM)BobH Wrote: Cella lathered well for me but I gag on the scent. It does not smell like almonds to me at all. Same with Vitos Red, lathered well but the scent was like Cella. This put me off almond scented soaps. I'm starting 100g cut from a Brick tomorrow. I find the scent OK, more natural then some of the Cherry Almond scents that are overpoweringly strong and sweet. (12-23-2014, 04:32 AM)BobH Wrote: Funny how people perceive scent differently. I have found, when it comes to things shaving, that is so true, all across the board. I've been wanting to try the brick version for some time now, but can't pull the trigger for some reason. I just tried the brick version and let me say it was really nice!! Smell was light. Not overpowering like others have rated. Super soft and easy to mold in a bowl. It did want a lot of water. Even more than Arko! Once hydrated it was slick and offered great cushion! Kinda wished it had a stronger smell so I could smell it throught the morning. If you haven't tried the brick version I suggest you do!